- Best Choice for Better Life! Enhance your kitchen room with this Kitchen Sink Soap Dispenser!! 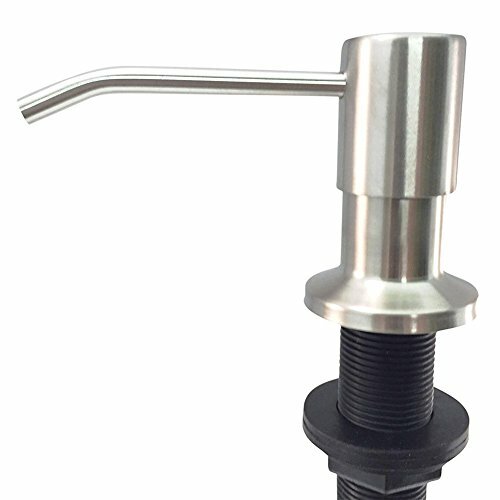 2.The Stainless Steel Pump Head on our soap dispensers has a 3.15" nozzle so you can easily pump dish soap right into the sink. The top of the pump pulls off so you can simply add soap from the top of the dispenser... and never crawl under the counter. 4. You can use it for kitchen, bathroom, washroom and many more purposes. Our priority is your satisfaction.If you have any problems, please contact us through Amazon email at the first time.Normally, you will get reply in 24 hours. Don't Delay. Scroll back up the top of this page and purchase with confidence. 1, 100% QUALITY GUARANTEED!!! ON SALE for LIMITED SUPPLY. Satisfaction or get your money back. TOTALLY RISK FREE, why not give this quality of soap dispenser for kitchen sink a try? 3, TDA-HomeCare Sink Hand Dish Soap Dispenser: The pump head is LARGE CAPACITY (17 oz) bottle, 3.15" nozzle. Dish soap can be pumped into the sink manufactured with quality materials work as a soap dispenser, lotion dispenser or as any liquid dispenser. 5, MULTIPURPOSE USE - Our Brushed Kitchen Sink Soap Dispenser can be used in a variety of ways whether you want to fill it up with soap hand sanitizer, shampoo, shower gel, etc. And perfect for any at home cleaning, cooking or DIY uses. If you have any questions about this product by TDA-HomeCare, contact us by completing and submitting the form below. If you are looking for a specif part number, please include it with your message.